I visited the Goleta Butterfly Grove at Ellwood Mesa this past weekend (it's 12 miles north of downtown Santa Barbara, California). 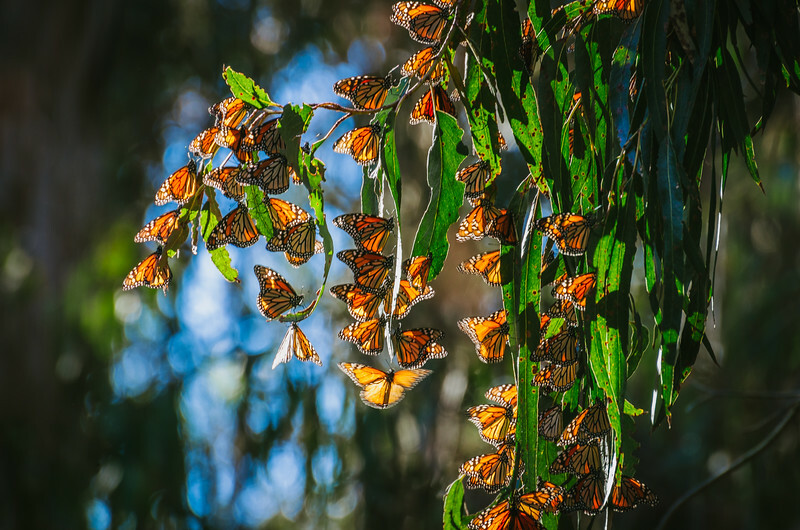 There were literally hundreds, if not thousands, of the monarchs who had returned for their annual winter migration and were flitting about a very small area. And my best photo? The one above with only two of the monarchs -- one prominent and the other blurred in the background. This was a tough place to shoot for several reasons. The first was a docent that would not STFU, making it hard to concentrate or even enjoy the spectacle. This was one of those ladies with a big fat mouth who obviously liked being a docent because it forced people to listen to her. 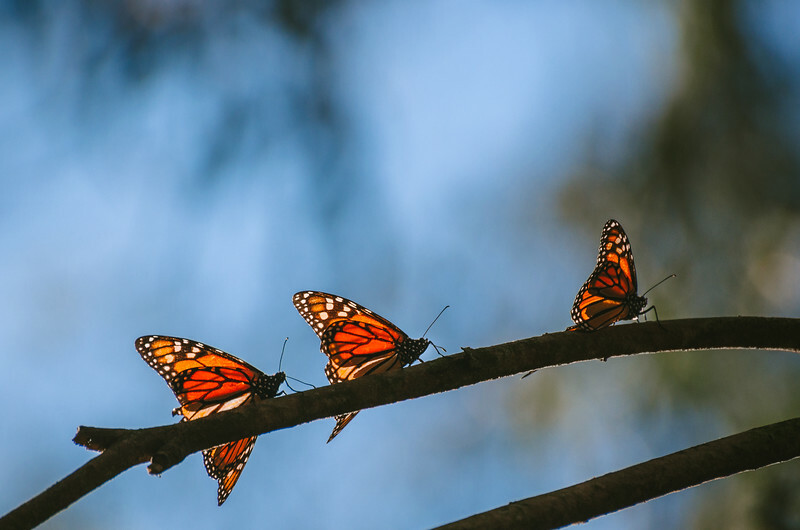 Also, the trees where most of the butterflies gather is roped off, meaning there are only so many angles and you really need a telephoto lens to get shots such as above. And the grove and the milkweed that attracts the butterflies is in a pretty dense grove of tall eucalyptus trees that shade a lot of the light. The mistake I made was that I spent too much time trying to get one particular type of photo. I was trying to shoot at a slow speed to capture the motion of the butterflies that were taking off and landing on the branch. Not a bad idea. Problem is, that slow speed didn't allow me to get a crisp capture of the butterflies sitting still on the branches. Those butterflies need to serve as the foundation of such an image and if they're not sharp, then what's the point? The photo above looks okay at small sizes but the lack of sharpness, of course, becomes an issue at larger sizes. I'm crazy about the lower branch in the above photo, but it is what it is. 1. Plan on spending a good chunk of the day at the grove so you can try different angles and see the light as it changes throughout the day. 2. Bring your best telephoto lens. If you don't have one for your DSLR, borrow one or rent one from a local camera store. Have one that extends to 300mm really helps over the usual 200mm models. 3. Bring a tripod to help keep the camera still (I didn't use one; dumb). You may not use all the time, but there will likely be some chances for good closeups of butterflies that stray to near where the visitors are allowed to stand. 4. Try to get at least a few photos at high shutter speeds that help freeze the action. Those are your safety shots. Then play around with slower shutter speeds to try to capture the movement and volume of the butterflies.